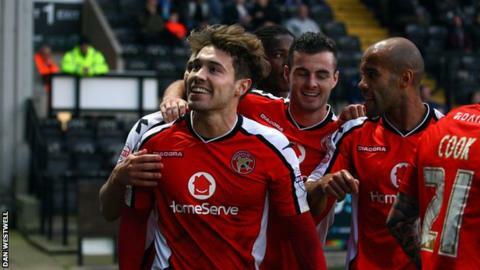 Walsall striker Tom Bradshaw's seventh goal of the season ended Notts County's 11-match unbeaten run. Gary Jones' own goal gave Walsall the lead in the 16th minute. Midfielder Garry Thompson equalised just after the half-hour mark after meeting Stephen McLaughlin's cross. But Bradshaw netted a second-half spot-kick after Haydn Hollis handled the ball, which was first adjudged to be just outside the box before the referee was overruled by his assistant. Match ends, Notts County 1, Walsall 2. Second Half ends, Notts County 1, Walsall 2. Attempt missed. Shaun Harrad (Notts County) header from the centre of the box is close, but misses to the right. Corner, Notts County. Conceded by Richard O'Donnell. Attempt saved. Liam Noble (Notts County) right footed shot from outside the box is saved in the top left corner. Corner, Notts County. Conceded by Ben Purkiss. Attempt blocked. Ashley Grimes (Walsall) right footed shot from outside the box is blocked. Corner, Notts County. Conceded by James Chambers. Substitution, Walsall. Ashley Grimes replaces Tom Bradshaw. Attempt blocked. Nicky Wroe (Notts County) right footed shot from outside the box is blocked. Attempt missed. Tom Bradshaw (Walsall) right footed shot from outside the box is too high. Substitution, Walsall. Malvind Benning replaces Jordan Cook. Substitution, Notts County. Nicky Wroe replaces Gary Jones. Michael Petrasso (Notts County) wins a free kick in the defensive half. Attempt saved. Jordan Cook (Walsall) right footed shot from outside the box is saved in the centre of the goal. Attempt saved. Tom Bradshaw (Walsall) header from the centre of the box is saved in the centre of the goal. Corner, Walsall. Conceded by Haydn Hollis. Foul by Michael Petrasso (Notts County). Michael Cain (Walsall) wins a free kick in the defensive half. Substitution, Notts County. Ronan Murray replaces Stephen McLaughlin. Goal! Notts County 1, Walsall 2. Tom Bradshaw (Walsall) converts the penalty with a right footed shot to the bottom left corner. Haydn Hollis (Notts County) is shown the yellow card. Penalty conceded by Haydn Hollis (Notts County) with a hand ball in the penalty area. Attempt missed. Romaine Sawyers (Walsall) left footed shot from outside the box is just a bit too high. Substitution, Notts County. Shaun Harrad replaces Garry Thompson because of an injury. Attempt saved. Anthony Forde (Walsall) right footed shot from outside the box is saved in the centre of the goal. Mustapha Dumbuya (Notts County) wins a free kick in the attacking half. Attempt missed. Liam Noble (Notts County) right footed shot from outside the box misses to the left. Second Half begins Notts County 1, Walsall 1. First Half ends, Notts County 1, Walsall 1.